Affected Animals: Any cat can develop feline acne; infectious causes of chin dermatitis such as feline demodex are more common in immunosuppressed cats, and allergic cats can develop chin dermatitis due to scratching and rubbing of the chin. Clinical Signs: Chin dermatitis can show mild symptoms such as patchy hairloss, small crusts, and plugged hair follicles (comedones) with black flecks of oily debris; in severe cases the plugged follicles can rupture, creating chin swelling, inflammation, pain and drainage. 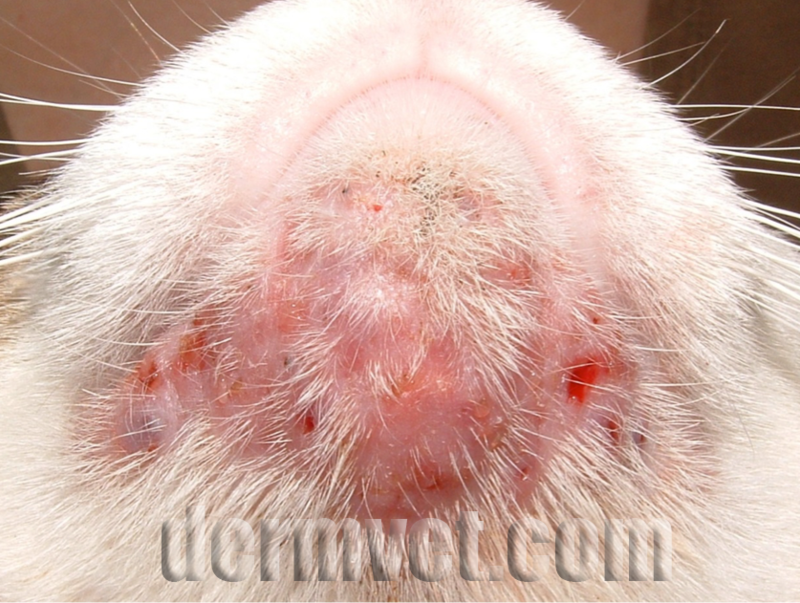 Diagnosis: Diagnosis of feline acne is made by clinical examination, and microscopic examination +/- bacterial and fungal cultures to look for infectious causes of chin dermatitis such as bacterial, fungal and demodex mite infections. In some cases biopsy is performed and usually shows inflammation and rupture of hair follicles. Prognosis: The prognosis is good for most cases, although recurrence is possible and some cats require intermittent topical treatments for control. Treatment: Remove plastic and stainless steel bowls and use ceramic bowls. 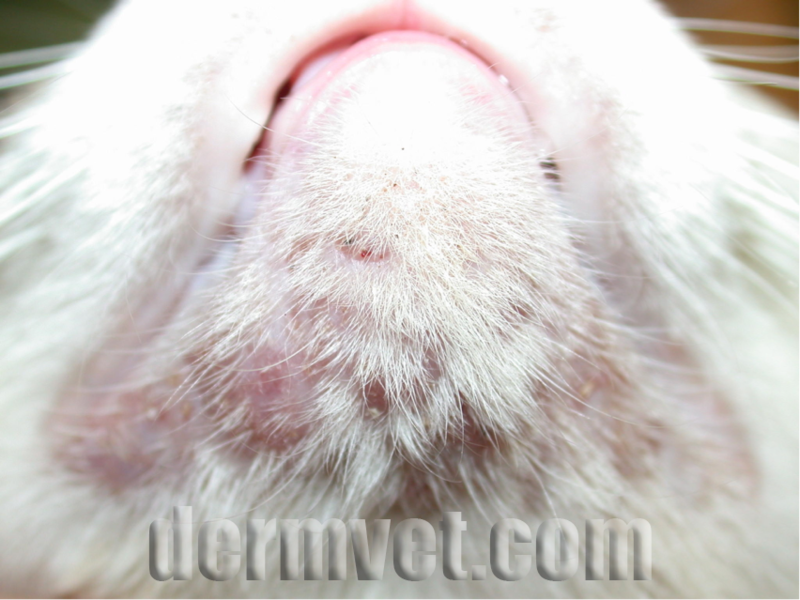 Treatment of milder cases of feline acne can involve periodic use of mild antimicrobial or salicylic acid wipes and/or antibiotic +/- steroid containing ointments. Benzoyl peroxide shampoos/gels may be helpful to reduce follicular plugging, but can be very irritating in some cats and should be used with caution. Topical retinoid creams/gels may be helpful in some cases. In severe cases, systemic antibiotics +/- steroids are used. In cases which are suspected to have a viral trigger, antiviral therapy may be tried such as l-lysine.